Olga Ganzha is a Russian-born Amsterdam-based artist and graphic designer; therefore her projects often balance on the edge of art and design. She connects disjointed elements and ritualizes personal memories of history and culture. ‘Want to see my etchings?’ originated from a fascination in etching technique, its metaphysics, and magic. Etching is a classical printmaking process that is rarely used in nowadays world full of digital and manipulated images. However, the technique has an ability to catch time, to document, to tell stories. But only in case the technique and material is appreciated and not being simply used for its reproductive qualities. Only then the magic happens. 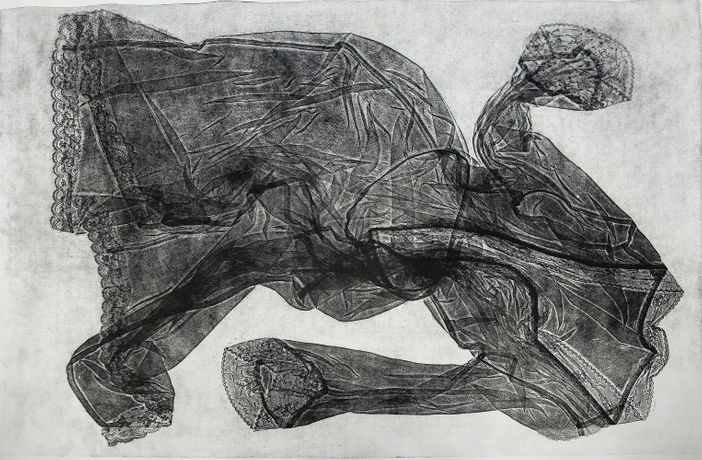 Studying abilities and flexibilities of etching, Olga Ganzha created a visual essay based on her research of the technique as a new language in her practice. ‘Want to see my etchings?’ started in May 2016 from two months work-study phase in Ukraine, where Olga visited several printmaking artists and a healer. The project continued as an experimental based two months residency period at AGA LAB in Amsterdam. The exhibition at the Bookstore Space is the first presentation of the process and results of this research. This project is made possible with the support of Amsterdam Art Fund (AFK) and Stichting Stokroos.